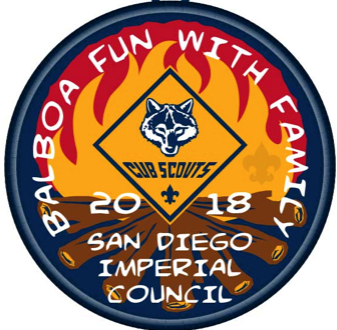 Cub Scout FAMILIES are invited to this FUN-FILLED EVENT at Camp Balboa. Cost: $30 per person by Sept 7, includes Saturday Lunch & Dinner and camping Saturday night. Check in is from 5-9pm Friday the 21st. Sign up for activities (first come-first served). PLEASE CONSIDER CARPOOLING or DROP-OFF as parking is LIMITED. Friday night camping is on your own, there will not be program. If you come Saturday only, Check-in will begin at 8 am. SATURDAY: Activities are open from 9 am to 4 pm. Range sign ups will be available Saturday morning during check-in. A detailed schedule will be available the day of the event. Includes Lunch and Dinner. Cub Scouts will perform skits and songs at the campfire on Saturday night at 8 pm. SUNDAY: Enjoy an optional breakfast ($6), participate in the "Scouts Own" worship service and clear your campsite. Check-out by 10:00 am. WHAT TO BRING:Completed BSA Health Form PART A & B for every camper ( adult and child), tent, sleeping bag, sleeping mat, clothing for warm and cold weather, hat, toiletries, sunscreen, water, snacks, chair, and flashlight. **OPTIONAL: Friday evening camping is optional; however there is no program or meals Friday night/Saturday morning. WHAT NOT TO BRING: weapons (toy or real), pets, skateboards, bicycles, electronics, or alcoholic beverages. NO OPEN-TOED SHOES or SANDALS. Please submit all requests for cancellations and refunds to Fun with Family Camp at sdiccamp@scouting.org or mail in your request to Family Camp SDIC-BSA, 1207 Upas Street, San Diego, CA. 92103. The deposit is non refundable.